If you had your school education in India, you must have been fed every single detail (real and imaginary) about the role of the Congress party in attaining freedom for India. However, chances are that you have been told little or nothing about the Congress party’s war on freedom that they fought in earnest starting from 1950. 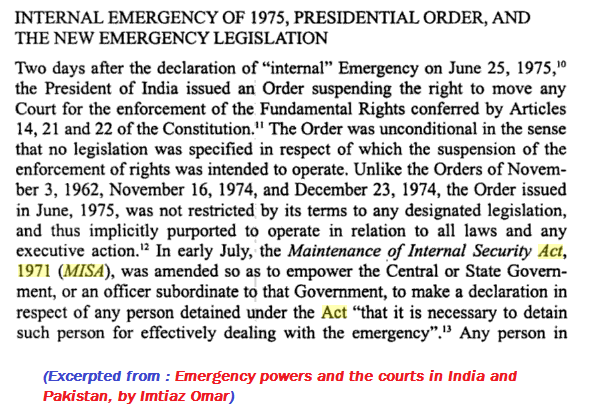 Since today is June 25, the anniversary of Madam India / Indira Gandhi declaring Emergency, it seems like a good time to tell this story. Since the Congress’ War on Freedom was a long and protracted conflict, I have tried to break it down into a series of steps. Please keep in mind though that I am neither a historian nor a legal scholar, so there might be several others steps that I don’t know about. I apologize in advance for any such omissions. The Constitution came into force on Jan 26, 1950, officially making India a sovereign republic. “Preventive Detention” meant that people could now be picked up by the state and thrown into jail if the government was satisfied with the argument that they might commit certain crimes. Also to be noted is that the Act was initially to remain in force for just one year. At the end of the year, the ruling party wanted more and more and the act just kept getting extended over and over all the way till December 31, 1969 (and it was made permanent in a new form after that : we’ll get to it later). From one year to twenty years. Power once taken from the people is not easily returned. (2) Free Speech dies quickly : First Amendment Act, 1951. During the period 1949-50, the Indian judiciary delivered two significant whacks to the Congress Party’s censorship initiative. The first involved a Delhi government bid to gag the RSS mouthpiece Organiser. The other was related to a Madras government bid to gag the Communist inclined magazine called ‘Crossroads’. Again, the Congress party wasted no time. They decided that enough was enough and it was time for India’s young constitution to see its first ever amendment. (a) First, it imposed “reasonable restrictions” on free speech. The government now gave itself sweeping powers to curtail speech on the grounds of preserving “public order, decency or morality”. The moral police became the official police, with the full backing of the government, and anyone with muscle power, who could threaten ‘public order’ by getting upset, got the license to put ‘reasonable restriction’ on your free speech. The super highway of freedom was now reserved for the state and its preferred notion of “decency and morality”. The people were relegated to the sidewalk with its “reasonable restrictions”. If it is any consolation, I assure you that Free Speech died a quick and painless death after only one year of the Republic. It didn’t have to suffer too much. (b) The second thing that the Amendment did was more mischievous. The Amendment added a new Schedule to the Constitution : the Ninth Schedule. The Ninth Schedule was like a charmed coat of armor protecting a mythological hero. Any law that the government decided to put inside this newly created Ninth Schedule would no longer be subject to judicial review (Article 31-B). Feel like doing something unconstitutional? Just gift wrap it and put it inside the Ninth Schedule. It will magically get immunity from all legal challenges. Clever, no? We will see later how this gem of legislation was passed down the family from father to daughter and came in really handy in 1975. Fun Fact: In a landmark judgement, a nine judge bench of the Supreme Court decided in 2007 to remove such blanket immunity for stuff placed in the Ninth Schedule. Well, we can’t hold this one against them, right? After all, you would need some emergency powers during the five year period of the Indo-China war from Oct 1962 to Jan 1968. Wait, what? A five year war between India and China? When did that happen? The Indo-China conflict lasted about a month. But the Congress used it to impose a five year emergency. Maybe they just conveniently forgot to give us back our Fundamental Rights when the conflict ended. It is perhaps important to explain here what exactly happens to our rights during an Emergency. The Emergency powers of the government are mostly described in Articles 358 and 359 of the Constitution. (a) Article 358 suspends all Fundamental Rights contained in Article 19 (Freedom of speech, Freedom of peaceful Assembly, Freedom to move freely throughout India, etc.) This comes into force automatically when the Emergency is imposed. The mute button on free speech is pressed automatically with no need for a separate declaration. (b) Article 359 gives the President the power to issue declarations suspending the right to move the courts for enforcement of Fundamental Rights. This means that these rights are not automatically suspended when Emergency is proclaimed. The President must give explicit orders to suspend these rights. 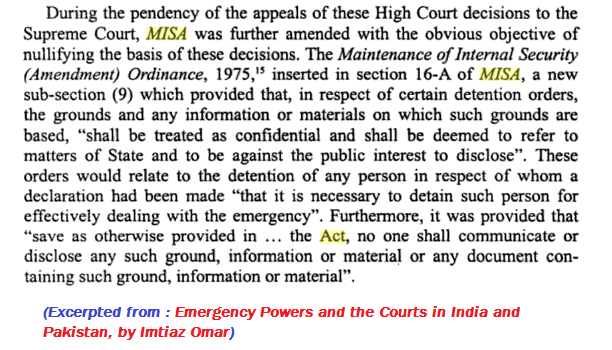 It should be noted that the Emergency Articles 358 and 359 were substantially weakened after the 44th Amendment Act, 1978. What I have described above is the law as it used to be when Nehru imposed the Emergency in the 1960s and when Indira / India Gandhi imposed it in the early 1970s. Five years of emergency for a one month war. So much for liberty! Remember how the Preventive Detention Act (PDA) of 1950 was allowed to expire in December 1969? Now why would Indira / India Gandhi let go of such delicious power? The answer lies in the fact that the PDA (1950) had one very annoying provision : it was temporary. Every few years, the legislature would have to go through the exertion of having to renew it. Although the original act which was intended for just one year had no trouble getting renewed for twenty years, such exercises that are even of cosmetic value to democracy have no place in India / Indira Gandhi’s scheme of things. Now we are talking! Ye hui na baat! The Preventive Detention Act was now enacted as a permanent statute in the form of the Maintenance of Internal Security Act (MISA). Atal Behari Vajpayee, Lal Krishna Advani, Devi Lal, George Fernandes and Lalu Yadav are some of the big names that were arrested under MISA. It should be noted that the MISA had nothing to do with the Indo Pak war of 1971. The MISA was passed in July of 1971 as a permanent statute, whereas the Indo-Pak war happened in December of 1971. Earlier, we talked about how the Congress party managed to convert a one month war into a five year emergency starting in 1962. However, Indira / India Gandhi realized she could do much better, turning a two week war with Pakistan into five years of Emergency. Well, clearly the plan was to have an emergency that stretched forever; it is just that she lost out in her 1977 gamble. The war came and went in just 2 weeks of December. But the Emergency that was declared on December 3, 1971 continued. But India / Indira Gandhi decided to make us surrender our Fundamental Rights in Nov-Dec, 1974, almost three full years after Pakistan surrendered in Dec, 1971. 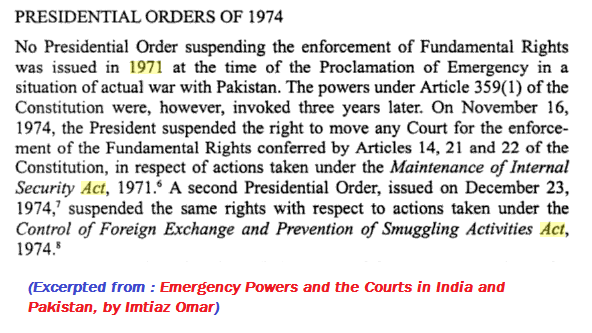 The purpose of this action in 1974 was of course to protect the nation during the war of 1971, just in case Pakistan managed to get their time machine working. So, Article 14 of the Constitution which grants Right to Equality under the law … gone! So, Article 22 of the Constitution which gives protection from arrest and detentions … gone! And of course Article 21 of the Constitution which grants “Right to Life”, including the Right not to be executed without a trial … clean bowled! And in case you forgot, the rights under Article 19 (Free speech) were automatically retired hurt to the pavilion the moment Emergency was declared in 1971. It saved them the trouble of having to issue a separate declaration removing the freedom of speech. No equality under law, no protection from arrest and detention, no free speech and no right to a trial before getting executed by the state. Remember that this was the situation before the infamous Emergency of June 1975 began. This was the prevailing legal situation when India / Indira Gandhi ji realized that this was still too much freedom and it was time to crack the whip. This was supposed to be the final fall of the guillotine on freedom in India. As bad as the already existing emergency of 1971 was, Indira / India Gandhi decided to impose another even more stringent emergency in June 1975. Remember the earlier order of 1974 destroying the protection of Articles 14, 21 and 22? That was too soft, because those orders applied only to individuals arrested under certain laws related to national security. The 1975 order was “unconditional”, i.e., the protections under Article 14, 21 and 22 were no longer available to anyone no matter which law he/she happened to have been arrested under. And for good measure, the government decided to amend the already draconian MISA act to add a new Section 16-A, which said that the government no longer needed to even disclose the grounds on which someone has been arrested. But even that was not enough. Remember the First Amendment of 1951 which created a new Ninth Schedule in the Constitution? The magic power of the Ninth Schedule created by Nehru was that any law placed in there would be immune from all judicial review. This family jewel that had been handed down from father to daughter was now pressed into service. India / Indira Gandhi then moved the 39th Amendment (1975) to the Constitution. The MISA Act was now placed within the Ninth Schedule, making it immune to all legal challenge. In fact, the “Statement of Objects and Reasons” in the 39th Amendment makes for absolutely captivating reading. 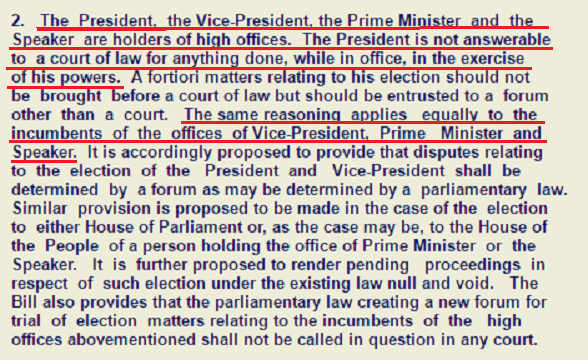 That’s right : The President, Vice President, Prime Minister and Speaker are holders of “high offices” and because they hold “high offices”, they are not answerable to courts for anything done while in office in the exercise of their powers. Reads like a death warrant of democracy, doesn’t it? Indeed, members of legislatures would no longer be disqualified by courts on the basis of holding “offices of profit”. Only Parliament can decide what is an “office of profit”. While taking over political power, no fascist organization ever forgets to make sure that their members are turning a profit at the expense of the people. It’s not just about power. It is also always about money. You know, court poet historians today will tell you that the Emergency of 1975 was some kind of a one-time mistake that the Congress and Indira Gandhi made. As if the Congress was driving down the highway of freedom, but suddenly made one wrong turn. Nothing could be farther from the truth. It was a planned and very systematic offensive that began right with the Preventive Detention Act of February 1950. The Emergency of June 1975 was merely the culmination of a twenty five year war effort. It became a Waterloo for them. Further, many independent nations of Asia and Africa that were born in the wave of decolonization after World War 2 succumbed to fascist takeovers within a few decades. They were poor nations just like us. The Congress party thought they could do the same with India. To the eternal credit of the Indian people, we resisted successfully. That’s where our liberty came from. Don’t let any court poet historian tell you that our liberties descended from above, as a gift either from the British or from the Gandhis. We the people lifted ourselves up to our liberty that we have today.